Hector Arana Jr. came off a disappointing event at the NHRA Gatornationals to turn in an absolutely scintillating performance at the NHRA 4-Wide Nationals at zMAX Dragway in Concord, NC. 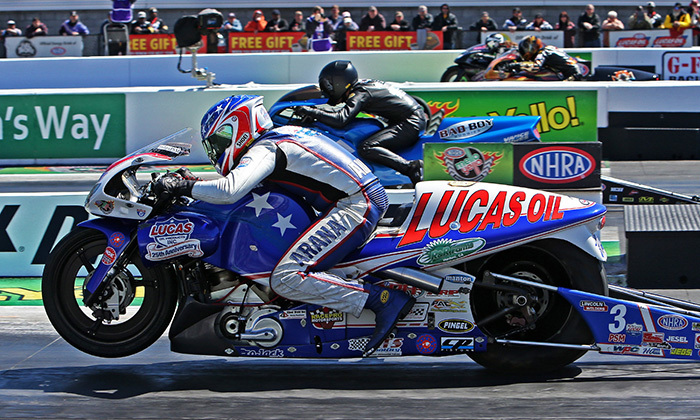 Arana Jr. qualified in the #1 position at 6.794 seconds and set a new national speed record of 199.88 mph on his S&S-powered Lucas Oil Pro Stock Buell. Arana Jr. debuted a new EBR 1190RX-bodied machine at the season-opening Gatornationals in Gainesville, FL, only to withdraw it from competition due to handling issues. For the 4-Wide he switched back to his trusty Buell XB9R and quickly distanced himself from the pack. The 4-Wide event is unique on the NHRA tour. Held at the 4-lane “Bellagio of Drag Strips”, zMAX Dragway, racers qualify and run eliminations four-abreast, with each elimination “quad” producing two racers that advance to the next round. With this format the usual four rounds of eliminations is cut down to three. The fall event contested last year at zMAX - run in the traditional 2-lane format - was problematic. Weather conditions caused rubber to peel and concrete to crack on the racing surface. V. Gaines crashed his Pro Stock Car during the start of Sunday’s eliminations and subsequent rain settled the issue, forcing cancellation of the event. As one would expect, the owners of zMAX Dragway, Speedway Motorsports Incorporated, didn’t take the situation lightly and repaved the facility, applying state-of-the-art, glass-smooth concrete for the first 700 feet of racing surface and equally-smooth asphalt the rest of the way. For this year's event a weather front moved in on Friday and cancelled the first two rounds of qualifying. In its wake it left cold, dense “mine shaft” air and sunny skis to warm the racing surface – absolute optimal racing conditions. The forecast for the rest of the weekend called for fast. Arana Jr. came out of the gate hard, running a track record 6.794 at 194 mph in the first session which held as the top qualifying position. Following Arana Jr. on the qualifying sheet was reigning series champ Andrew Hines on the Harley-Davidson V-Rod at 6.826, Angelle Sampey on the Star Racing S&S-powered Buell at 6.853 and LE Tonglet on his Suzuki at 6.861. After two rounds of racing the final quad consisted of Arana Jr., Hines and teammate Eddie Krawiec and Scotty Pollacheck on the Petrolhead Apparel Buell. Pollacheck renewed his sponsorship with the racewear maker for 2015 and will run the full season with Matt Smith Racing-prepared S&S Pro Stock Motors. Pollacheck has teamed up with Chaz Kennedy for the season. Arana Jr. ran the quick lap in the final, running 6.804 at the record-setting 199.88 mph, but was beat off the line by the Harley-Davidsons of Andrew Hines and Eddie Krawiec who placed first and second respectively. Pollacheck had a razor-thin -.003 redlight. 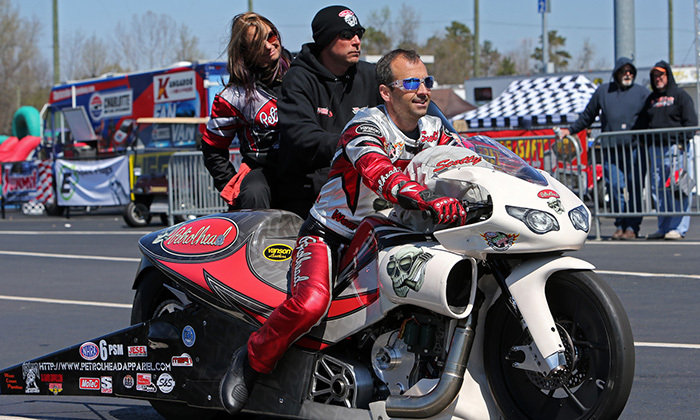 The NHRA Pro Stock Motorcycle racers will take a break and next hit the track at Summit Racing Southern Nationals at Atlanta Dragway, May 15-17.